Fractures of the hand and thumb. The metacarpal bones are the five long bones in the hand. Any of these bones can be broken or fractured but the 1st metacarpal under the base of the thumb is the most commonly injured. The fracture is usually caused by a direct impact which causes pain in the area. Treatment for these kinds of fractures usually involves immobilization in a cast followed by strengthening exercises. The metacarpals, particularly the base of the first metacarpal are usually fractured as a result of impact or sudden trauma such as punching something hard. Fractures can also occur as a result of a fall onto the hand where the thumb is extended out to the side. Symptoms will include sudden pain usually from the impact. Trying to move the hand will be painful and swelling will usually develop along with bruising a bit later. In a severe fracture known as a displaced fracture, the hand will appear deformed. Fracture of the base of the first metacarpal can occur from punching a hard object such as a wall or someone’s head or from a fall onto a sticking out a thumb. 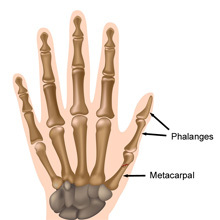 There are two forms of metacarpal fracture which may occur. A transverse fracture near the base of the thumb results in the thumb being positioned across the palm of the hand. Treatment for this type of fracture should be a reduction or re-positioned of the bone back where its normal position is followed by 4 to 6 weeks in a plaster cast. A Bennett’s fracture dislocation of the joint between the metacarpal and the carpal bones of the wrist is a specific and more serious injury requiring surgical treatment from a specialist wrist and hand surgeon. Fractures of any of the other four metacarpals can also occur from a punch. The 4th and 5th metacarpals are most commonly injured and this is known as a boxer’s fracture. Treatment usually requires casting or splinting for 2 to 3 weeks before rehabilitation exercises can begin. Most metacarpal fractures which are straightforward without other complications are treated with immobilization in a plaster cast or splint for a period of 2-6 weeks depending on the type of fracture. More complex fractures or those with a displacement of the bones may require surgery. Rehabilitation of metacarpal fractures involves regaining the strength of the intrinsic muscles of the hand. Items such as hand putty and therapy balls can be great for doing this. A Boxer’s fracture is a break to either the 4th or the 5th Metacarpals which are the long bones on the outside of the hand. As the name indicates, this injury is usually caused by a hard impact against the hand, like a punch. Read more about how this hand injury can be treated. 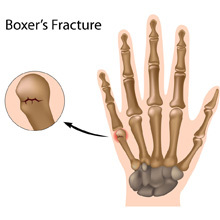 Boxer’s fractures are usually caused by punching something hard such as a wall or falling onto a fist. The patient will experience instant severe pain in the hand at the time of injury with swelling developing quickly possibly followed by bruising. The outside edge of the hand where the fracture is will be particularly tender to touch and moving the hand will be painful. The knuckle on the outside may appear dropped. Fractures to these two bones are known as boxer’s fractures due to the most common cause of injury being a punch. This can be to a wall or other hard surface such as someone’s head. The stress through the bone causes a break in the weakest area which is the neck of the bone, just below the knuckle. Medical attention should be sought immediately if a fracture of the hand is suspected. An X-ray can confirm the diagnosis. If the bone is aligned still then it may just be immobilized in a cast or splint to allow the bone to heal and most will heal without further problems. If however the bone is displaced or out of alignment then it may need to be set and held in place with pins, which requires surgery. Mr. Elliot Sorene MBBS FRCS (Tr & Orth) EDHS Consultant Orthopaedic, Hand & Upper Limb Surgeon explains surgery for Boxer’s fracture of the hand. A broken thumb is a fracture of either of the two small bones called phalanges which make up the thumb. A broken thumb is not as common as a broken finger but is just as painful! Icing the thumb and avoiding moving it can help ease the pain until a doctor examines it for any possible complications. Symptoms include sudden pain at the time of injury with immediate swelling and bruising that will come on rapidly. The thumb will be particularly painful when attempting to move it and it may also click during movement. Thumb fractures are not very common, partly because the bones are thicker and secondly because the thumb is opposable and shorter than the other fingers, so is often protected by bringing it across the palm of the hand. Whilst a simple fracture to one of the phalanges is relatively straightforward to treat and heals well, a fracture may be more difficult to treat if it is an end of one of the bones, near the joint. This is especially true of the Bennett fracture and the Rolando fracture which occur at the joint between the 1st metacarpal and the wrist. In sports, many thumb and finger fractures can be prevented by wearing the appropriate protective wear, such as gloves, padding or taping. Initial treatment of a suspected thumb fracture includes immobilization with a splint and applying ice or cold water to reduce pain and swelling. The hand should be raised up high above the heart to ensure gravity helps with reducing bleeding and swelling. If a thumb fracture is suspected then seek immediate medical attention. A Doctor will examine the hand for signs of any complications such as nerve or blood vessel damage. They will also perform an X-ray to confirm the diagnosis and check the fractured piece of bone is not displaced. If it is a simple fracture which has not become displaced, the thumb may be immobilized in a thumb spica cast which goes from the forearm to the hand and continues onto the thumb to immobilize the entire thumb joint. The cast is kept on for 3 to 6 weeks depending on the patient’s age. Younger patients will heal quicker. In some cases, a more lightweight splint may be used. In more complicated cases where there is more than one fragment or the bones are displaced, then surgery may be necessary. The surgeon may realign the fragments and fix them in place with pins. The thumb is again immobilized for several weeks. After the immobilization period, thumb exercises should be performed to help regain full strength and movement. Hand therapy putty and elastic bands are particularly good for this. A broken finger is a break or fracture in any one of the 3 small phalange bones which make up each finger. A broken finger will be the result of some kind of impact or collision. The athlete will feel immediate pain with swelling and bruising which will appear quite quickly. It will be painful to try and move the finger which may appear deformed if the bone is displaced or joint dislocated. If there is any nerve damage, the finger may be numb or feel tingly. A broken finger is a break or fracture in any one of the 3 small phalange bones which make up the fingers. This is a relatively common injury which often occurs when the finger is crushed between two hard objects. It may also occur from a fast-moving ball or similar striking the finger. Finger fractures may be common but it is important to get them checked out and treated properly. If a bone heals out of alignment, this could cause future problems, as well as looking strange! Fractures of the distal phalanx (the end bone of the finger) can also cause problems with the fingernail, especially if it was caused by a crush injury (see black fingernail). Blood may gather under the nail causing a build-up of pressure and pain. This may require draining. Immediate treatment of a suspected fracture should involve resting the finger, immobilizing it with a splint or buddy strap, applying ice and elevating the hand above the heart to reduce bleeding and swelling. Medical attention should then be sought. The finger should be X-rayed to confirm the fracture and determine if the fracture is displaced. If it is a simple fracture with no displacement (as most finger fractures are) then the finger can be splinted to immobilize it whilst it heals. This may be kept in place for 3-4 weeks. A finger buddy taping technique is sometimes used. More complicated fractures where the broken fragment is displaced or broken into more than one part, surgery may be required. This usually involves pinning the two fragments together so that they heal in the right place. Following immobilisation, the finger may feel particularly stiff and weak and so it is important to do mobility and strength exercises to regain full movement and strength. Hand putty and elastic bands exercises are particularly good for this.